I’ve had Type 1 Diabetes for 49 years – next April will be my 50th diaversary. When I was diagnosed in the 60’s/70’s, there wasn’t as much information about diabetes out there as there is now. But still, having diabetes never held me back from anything I wanted to do. I still travel, and I stayed out late in my 20’s and 30’s like any other young person would. I strongly believe that diabetes is just a part of life. The key is to accept it and make it part of your routine. There are professional hockey players who have diabetes. Gary Hall, Jr. has Type 1 Diabetes and he swam the 50-meter freestyle at the Olympics. They didn’t let diabetes stop them; they made it work. Put your sight on what you want to do and figure out how to do it (I just don’t know if they can send you into space yet). People are happy to work with you if you talk to them about your needs. When I was still in school, we went on ski trip to the Alps. At the time, they didn’t have refrigerators in the hotel rooms so I stored my insulin in the one in the kitchen. I got to know the kitchen staff pretty well and they were happy to accommodate me. Nobody has ever said “no” when asked to help. The only time my health factored into any of my life choices was when I decided not to become a physician. Sleep is very important for me and I knew I wouldn’t be able to function with the little bit of sleep med students get. But again, it was my choice based on what I needed to take care of my own health. I know my body inside and out, so I know when something isn’t right and how to adapt. When I have late meetings, I’ve learned to check my blood sugar and drink some juice before it starts so I don’t go low. My biggest piece of advice for parents or anyone who has been diagnosed with Type 1 diabetes is: take a deep breath and relax. If you were diagnosed as an adult, know there’s nothing abnormal about what you have. You can maintain your regular routine without much extra effort. The only time I need to pay more attention to my blood sugar is when I’m sick. I might have to take some extra time off from work to recover these days, but that could be because I’m getting older. If you’re a parent, let your kids be kids. Let them have fun at parties and eat a small piece of cake like the other kids (maybe take of some of the frosting first). Don’t stress too much about what they eat. You don’t have to make big formal meals. Sometimes when I get home late I’ll have cereal and fruit for dinner. Just use common sense and think about what you need to do to cover it with insulin. The human microbiome includes all the bacteria, both good and bad, that live in our organs. There are actually about 10 times as many bacterial cells in the body as human cells! Bacteria play many important roles in keeping us healthy, such as protecting us from invading bad bacteria and breaking down (or fermenting) the fiber in foods like vegetables that our own bodies can’t digest. Our microbiome includes many different types of bacteria, and more diversity is typically a sign of good health. Many diseases, such as diabetes, can reduce the diversity in our gut and create environments that are better for bacteria that produce substances that cause inflammation or other harmful effects. 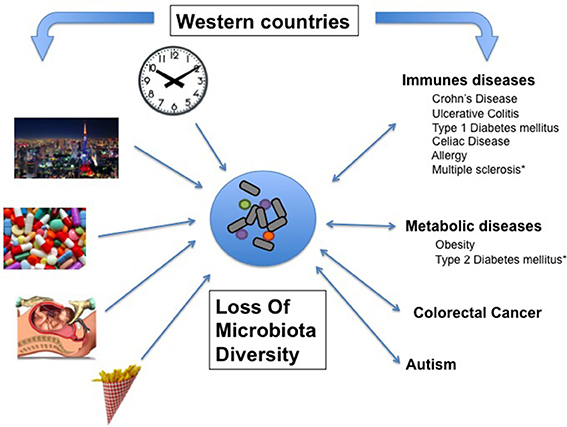 In this figure you can see many of the things that cause the microbiome to become imbalanced (such as taking antibiotics or poor diet) and some of the health problems that might result. The microbiome is such an important factor in our health that the National Institutes of Health have launched two versions of the Human Microbiome Project, granting hundreds of millions of dollars into research about the connection between changes in the human microbiome and disease. Is there a Link Between the Microbiome and Type 2 Diabetes? Type 2 diabetes can be caused by genetics as well as diet and lifestyle. Eating a healthy diet (one with lots of fiber-filled fruits and veggies and low in sugar and saturated fat) and exercising regularly can help keep your microbiome healthy and might help reduce the risk of developing diabetes. The short-chain fatty acids that good gut bacteria produce when breaking down fiber can increase your body’s metabolism and how quickly glucose in the blood is used up, which can help manage blood sugar. A recent study showed that a diet rich in fiber could improve diabetes management because it produces the short-chain fatty acids the cells of our gut lining need to be healthy. Fiber also reduces inflammation and keeps you feeling full, which helps with managing portion sizes and keep blood sugar steady after meals. The types of bacteria in the gut also shifted to the species that love a high-fiber diet, promoting health long into the future. How Can I Feed a Healthy Gut Microbiome? Eating a diet rich in fiber keeps your good bacteria happy. They break down molecules like cellulose found in fruits, vegetables, and whole grains. Limit high-sugar and high-fat meals. Bad bacteria thrive when we eat a high-sugar and high-animal fat diet. Try to limit foods like sodas, candy, large servings of fast foods, sugary baked goods, red and processed meats. Your healthcare provider many suggest taking a probiotic supplement to increase your good gut bacteria, particularly if you have recently taken antibiotics. The American Diabetes Association (ADA) publishes guidelines each January to educate professionals about the best clinical practice for people with diabetes. Beginning in 2018 the ADA will publish updates online as they become available if new evidence or regulatory changes require immediate incorporation. The new recommendations include the areas of cardiovascular health, health technology, screening , and patient centered care. These standards are meant to provide general treatment goals for people with diabetes. They are not meant to replace clinical judgment. I am going to briefly review some of the changes this year. A more detailed explanation of the standards can be found here. Please remember, that these are in no way meant to replace the individual care that you are participating in with your health care team. Care for people with diabetes includes assessing for financial resources, access to care, stability of housing situation, ability to access healthy food, and medication use. Additional support for diabetes self-management can come from community health workers, navigators (who help “navigate” health insurance and claims), and lay health coaches who help with self-management. Certain medical diagnoses can make A1c test results less accurate. People with conditions that affect red blood cells, such as sickle cell anemia, may get an incorrect result. It is important to use other methods to test for diagnosis and control of diabetes such as fasting and postprandial (after meal) glucose levels. Pancreatitis is now listed as a comorbid condition (another condition a person can have along with diabetes). Serum testosterone should be checked in men with symptoms of hypogonadism. Both sections address the ADA recommendations for using technology to help with diabetes management. This could include teleconference, text messages, or email. The use of continuous glucose monitoring (CGM) for people with Type 1 Diabetes should start at age 18. Recent study data has shown that all patients newly diagnosed with diabetes should be following strict lifestyle changes and start metformin. People with heart disease should consider additional medication(s) that may reduce cardiovascular events/mortality. People with hypertension (high blood pressure) and diabetes should monitor their home readings to help to identify white coat hypertension and to improve medication management and following directions for taking medications. The ADA defines hypertension as blood pressure of 140 or greater /90 or greater. Lipid management recommendations were changed to group risk in two broad categories: with heart disease and without. Celebrate spring with this salad recipe from the MGH Be Fit program. Leftovers work well for a quick lunch—just keep the dressing separate and add before eating, so the greens don’t wilt. You can also add a hard-boiled egg to further increase the protein in this recipe. Place all ingredients in a small jar with a lid and shake until thoroughly combined (or whisk together in a small bowl). Taste vinaigrette; add salt and pepper as needed. In a medium saucepan over medium heat, combine the quinoa with 2 cups of water. Bring to a boil, then cover and lower the heat to a simmer. Cook for 15 minutes or until the quinoa is tender. Let sit for 5 minutes then fluff with a fork. (If your quinoa still has water in it simply strain it out.) Set aside until ready to assemble the salad. While the quinoa is cooking, sauté asparagus in olive oil in a medium skillet over medium heat until cooked through, about 7 minutes. Combine the cooked quinoa with asparagus, chickpeas, arugula, and scallions. Top with vinaigrette and feta cheese. There is a common misconception that once a person is diagnosed with diabetes they need to cut out all carbs. This is not the case! Carbohydrates are very important because they serve as the main fuel source for the body and give the brain and muscles the energy needed to carry out daily activities. Carbs, protein, and fat all play essential roles and can be incorporated into your meals and snacks to keep you feeling your best. Also, eating carbs with protein at every meal will help manage your blood sugar and help your body best utilize the nutrients in your food. There are many options when it comes to eating protein. These foods include meats, poultry, eggs, fish, cheese, cottage cheese, nuts, nut butter, and tofu. Why do we need to eat protein with carbs? During digestion, the food we eat gets broken down into simple sugars that are delivered to our muscles and liver through the bloodstream. Insulin is the “key” that “unlocks the gate” for sugar to leave the blood and enter the cells. When someone with diabetes eats large portions of carbohydrate-rich foods, too much sugar is released into the blood stream and, because there’s either not enough insulin or they have insulin resistance, their body is unable to use this sugar for energy effectively. This can cause high blood sugar, which, if it happens consistently over time, can lead to complications. Proteins (and fats) take longer to digest than carbs, so eating protein along with the carb slows down digestion in the stomach and absorption in the intestines. This will help slow the rate of sugar entering the bloodstream, keeping blood sugars steady and preventing blood sugar spikes (and crashes). Check your blood sugars 2 hours after a meal to see the effects. Insulin: Get to know me! If you or a loved one is currently living with Type 2 Diabetes, understanding the insulin regimen your healthcare provider has prescribed may be intimidating or difficult to understand. If you sometimes wonder Why am I taking this? ; When should I take this? ; or Am I doing this right? you are not alone! Many people living with diabetes use different types of insulin, inject at different times of the day, and have various eating habits. But what does this all mean to you? Onset– the length of time it takes for insulin to reach the bloodstream and begins its job to lower blood sugars. Peak time– Time during which insulin is working at its full strength to lower blood sugar levels. Duration– How long insulin lasts to lower blood sugar levels. What Insulin are you currently taking? Long-Acting- Insulin such as Lantus has the longest onset time and lowers blood glucose evenly throughout the day. Mixed dose– NPH insulin may be mixed with a rapid acting insulin. Mixed dose is usually only used for people with a simple insulin treatment plan. Check with your healthcare provider and/or CDE if you have any questions about your insulin. They will work with you on the best time to take your medications. Insulin needs are based off many factors such as body weight, food intake, physical activity, use of certain drugs, and physical or mental stress. These factors may differ day to day, therefore It is important to check your blood glucose levels regularly. Keeping a log of your blood sugar checks is a great way to help you learn how food, exercise and activity, and stress can affect your blood sugar levels. If you see that your blood sugars are too high or too low for several days, this may be a sign that you need to change your insulin regimen. Studies have shown that having meal plans and preparations ahead of time can help manage your diabetes. Remember, there is not a standard diabetes meal plan, so create one that works best for you and your lifestyle with long term goal setting. Having scattered meal periods throughout the day can throw your blood sugar out of whack. Creating a regular schedule for healthy meal and snack times can help manage your blood sugars by coordinating your insulin regimen with meal times. If you would like to schedule an appointment with a registered dietitian from Massachusetts General Hospital, call the Outpatient Nutrition Counseling at 617-726-2779. Moving off to college and living on your own for the first time can be a major adjustment. Personally, the biggest adjustment I found was learning how to cook for and feed myself on a regular basis around classes and other activities. Through my experiences in college and living on my own, I’ve acquired a few tips and tricks when it comes to cooking, including tips about cooking for only one person, eating healthy, and eating inexpensively. One of the more prominent challenges when it comes to living on your own is adapting recipes – whether they’re from websites, apps or even good ole’ fashioned cook books — that make 4-6 servings for one person. My first tip is embracing freezer meals. By freezing leftovers, you can cook recipes without having to adjust to fit your serving size, and you have future quick and easy meals readily available. All you must do is heat them up! Personally, I’ve found this very helpful with dishes such as lasagna, soups, breakfast sandwiches, muffins, quesadillas, and casseroles. Another freezer tip you can use is instead of freezing whole meals you can freeze pre-cut ingredients so that they won’t go bad, and they’re ready to use whenever you need them. I’ve found this helpful in: soon to expire fruits that can be used for smoothies; leftover vegetables such as onions, carrots, and celery; and even products like cheese or breads. I use this most often when I need to cut a recipe in half (or even quarters) to fit my serving size. If I’m left with three-quarters of an onion in my fridge, I’ll cut it up, bag it, and freeze it for future recipes. A common myth is that it’s cheaper to eat unhealthy foods than healthy foods. Eating healthy doesn’t have to be expensive. You can save a lot of money by eating out as little as possible and doing more home cooking. As you do more grocery shopping, you’ll learn that vegetables, grains and beans are much cheaper and more accessible than meat. I’ve also found that shopping is easier if I plan out what weekly meals I will be cooking at the beginning of the week and decide what ingredients I need before I get to the store. This way, I’m not making trips to the grocery store every two days or buying things I don’t need that then go to waste. When shopping, be sure to stick to foods that will give you the most nutrients, like brown rice instead of white rice, whole-wheat bread products, and stay away from processed ingredients/foods that are high in sugar. When shopping for produce, you can save a lot of money by buying fruit and vegetables that are in season or on sale in bulk and freezing what you don’t use. Lastly, many people don’t like to cook at home because they don’t have a lot of cooking experience or confidence. Some would-be cooks don’t know where to find recipes, or they don’t know how to cook for their own food preferences or dietary needs. There are many great websites, beginner’s cookbooks, and apps with hundreds of delicious recipes and easy to follow, step-by-step instructions for those who are new to the kitchen. These will help you be inspired to eat at home more, which will save you money and help you eat healthier. Overall, cooking is an individual process. There are going to be ideas that work for you and ideas that don’t. This will be mostly dictated by personal preferences and needs. The most important thing is to be constant in cooking at home and cooking with quality ingredients.